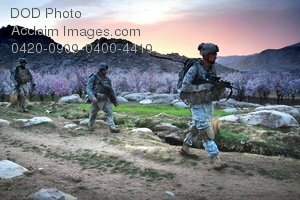 Description: Free, public domain image: U S Army Unit Patrolling Near Zbul, Afghanistan. U.S. Army Sgt Robert Newman, right, Bravo Company, 1st Battalion, 4th Infantry Regiment, U.S. Army Europe, leads his fire team on an early-morning dismounted patrol mission near Forward Operating Base Baylough, Zabul, Afghanistan, March 19, 2009. (U.S. Army photo by Staff Sgt. Adam Mancini.